Every approved moving company on our website will offer moving and storage services. So, whether you are moving or storing business equipment or personal belongings, our partner companies have the right solution for you. In most cases you can choose between several types of storage like, self storage, containerized storage and temperature controlled storage facilities. Flexibility: The storage company will work around your agenda, which will allow you to pack things at your own speed and use the container for as long as you desire. Safety and security: You can lock your container and keep the key with you. You will not have to risk breaks or dents by moving your things multiple times. The storage containers are even at ground level, so there are no ramps. Affordable price: The prices are affordable and they do not involve any hidden costs. Reliable: From an approved and insured company, you can expect a reliable service. Control: With a reliable moving business, you will have better control over your belongings and over the entire process. This is because everything is done according to your schedule, meaning nobody has access to your belongings, except you. Different companies has different solutions available. So it pays to shop around a little on our website until you find exactly what you need. Storage containers will offer you a better way to store your belongings. Maybe you are having construction work done, and need a safe place to store your belongings. Maybe you have outgrown your garage or home and need additional storage without having to tow things backward and forward to some off-site self-storage storehouse. Whatever your circumstances, these companies are the perfect solution for short and long-term storage. 1. Containers allow you to pack and unpack your belongings at your own speed. They can either be stored at a convenient location for trouble-free access or they can be stored in a dry and safe storage facility provided by the company. 2. Lower cost, because you don't need to pay for a full storage room. Containers come in different sizes, such as 8x8x16, 8x7x7, and 8x8x12, so you will be capable of storing your container according to your needs. Usually, all containers will be constructed to be weather resistant and they will be tested to resist the maximum wind velocity of 110 miles per hour when they are partially packed. As the delivery trucks of these moving companies are outfitted with the original lift system, they can minimize the transfer of contents during transit to their storage facilities. If you decide to keep your belongings in a storing facility, you are guaranteed that they would get the best and safest care available. Generally, the storage facilities offered will be maintained in a safe, clean, and dry way and several of them are weather controlled, as well. Most moving companies will have many convenient and safe storage solutions near you with trouble-free and 24/7 accessibility. They will also provide immense deals on moving and packing provisions as well as content safety options. 1. Individually designed for safe storage. 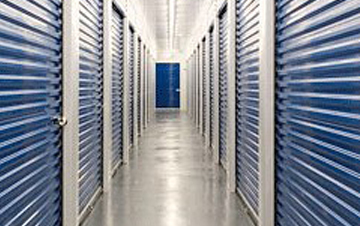 Self storage is a business in which storage spaces, such as lockers, rooms, containers, and, or other outside spaces are rented to leaseholders. These spaces are usually offered on a short-tenure basis, usually one or two months to individuals for storing domestic goods and to businesses for storing surplus stock or archived records. Some facilities offer locks, boxes, and packaging materials for sale to help tenants in packing and protecting their goods, and may offer truck rentals, as well. 1. Store by volume: The store by volume option is a flexible substitute to the traditional self storage, as you will be charged only for the space your item takes up. Through this option, you can store things, such as furniture, boxes, mattresses, etc. 2. Truck leasing: As moving and storage habitually go hand in hand, some moving and storage businesses offer rental trucks as a self driving option. The managers of the self storage facilities of these businesses can get you set up with a leasing truck and any packing and moving goods you might require will be made easier. This is the most convenient and the simplest moving and storage alternative. 3. Record storage: Self storage can be an immense solution for companies whose office is overflowing with documents and papers and need a safe place to store their file boxes. Some facilities also offer document-moving services for companies. The storage units are individually designed with shelves to maintain your documents off the floor and they will be organized in a better and safe way. A warehouse is a business structure for storage of supplies, used by importers and exporters, manufacturers, transport businesses, wholesalers, customs, etc. They are usually large simple buildings in industrial parts of villages, towns, and cities. Usually, they have loading docks to load and unload supplies from trucks. They are designed to keep the merchandise safe and protected at all times. 1. The warehouse storage allows manufacturers to manufacture goods in expectation of demand in the future. 2. Creates time value by delivering the time break between the product manufacture and the consumption of products. 3. Guarantees an expected delivery of products in the market. 4. Storing goods that are not required immediately to meet the prospective demand. 5. Perishable products can be stored safely using cold storage. A storage unit is a storage space, which is similar to renting an apartment, but without the long-tenure commitment, usually month-to-month. Users have to pay a rental fee on the first of every month until they no longer require their storage space. A storage unit is ideal to store furniture, equipment, office files, vehicles, etc. A full-service moving business will be capable of offering residential and commercial movers with safe, affordable storage-during-transit options as a complement to the conventional moving services. If you have plans to move your family to the other area but your new home is not ready, or you require some supplementary storage space until you move, an approved and reliable moving company can help by providing you with a variety of storage spaces according to your needs and your budget.